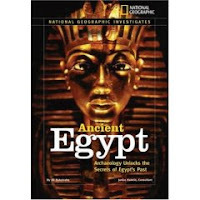 Ancient Egypt: Archaeology Unlocks the Secrets of Egypt's Past by Jill Rubalcaba with Janice Kamrin, Consultant. Series: National Geographic Investigates. Copy from Raab Associates. The Plot: Don't you love a title that explains it all? It's about Egypt. Ancient Egypt. And how archaeology unlocks Egypt's past. Including the secrets of it's past. Sometimes it's difficult to write these short plot summaries; other times, not so much. The Good: Long time readers may recall that I once wanted to be an archaeologist. But then reality sank in; I am horrible at languages. Goodbye, dream. Thank goodness for books like this, that may inspire someone else, someone who is good at multiple languages. (As some of you may guess, every single one of my female characters in the fiction I wrote as a teen could speak multiple languages. They also had green eyes.) At the same time, I am as intrigued by the past as ever, as my frequent History Channel watching proves. I especially liked Chapter 4, The Tomb Builders, because it includes the daily life of ordinary people. One scrap of pottery found at a site was a spell to prevent nightmares: "Come out with what you have seen so that your dumbness ceases and your dreams retreat. May fire come out against the thing that frightened you!" Also good: new technologies; new discoveries; protecting monuments and other artifacts. The bibliography includes books, articles (all from National Geographic), and web sites.